My Southern Sparkle: HE loves me! or at least my cooking! On Monday night, my DH came home with a gift. 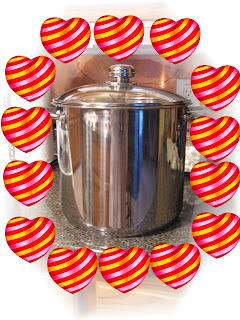 It was this gorgeous (yes, I say gorgeous) large stock pot! To say I was thrilled would be down playing my excitement. You may be thinking this isn't a great gift, and she has gone off her rocker, but to me it was superb and perfectly timed. See, many months ago my largest pot, which was a Revere Ware pot that we received when we got married 20+ year ago, finally bit the dust. So, I had resorted to using this really cheap pot I had actually picked up to use as the base of a "kitchen gift basket" one day when the need arose (I paid $2.50 for this high quality -not- pot). Well, last Sunday, when I was making the below mentioned soup, the cheapo-pot decided it would freak out and begin to change shape right there on my stove! It was kinda scary. I repotted the soup into 2 smaller pots and finished, but the cheapo pot was a done for. Imagine my surprise when DH shows up the next night with a wonderful new pot...better than either of the previously mentioned pots! It was so neat to know that he went to the kitchen store and picked it out just because he knew having it would make my life easier (well, that and he likes to eat!). I love that man! Your husband sounds so great! That is the best gift. I would have been thrilled also! Sometimes its the most practical gift that is the most meaningful. I got these for Christmas! He is so sweet an to get the gift for the sake of the gift means everything! I think that is a fabulous gift! I love my very large stock pot. I received a set of Revereware pots as a wedding gift twenty years ago also, and they are slowly beginning to die. They have served well. Oh, golly, got love an observant man!!!! Way to go, Mr. B.....he scored some major brownie points with that gift!!!! Wahoo! How thoughtful!! He really made a mental note and then followed through! A type of multi-tasking, which is sometimes unusual for men ;-) You've got a good Valentine for sure!! What a man! I LOVE getting kitchen stuff for presents. Contrary to what alot of gals might feel, I think its cool to get kitchen stuff. I have a few pieces of Revere ware that is decades old and still going strong. I love that stuff. Happy Cooking! Now that's love BOTH WAYS!! He gives you something as a surprise that you really want and you don't kill him when it is a kitchen item!! He actually pays attention...that's a rare and vaulable asset for a man to have! That was so sweet of him to do that for you! The fact that he was really paying attention to what would make you happy and then go out and get it says alot about the beautiful man that you are married to - he's a keeper! That is the epitome of romance!! OK girlfriend..you are once again missing...I miss you and your blog!! Drop by when you get the chance as I have tagged you for a little something fun! Honey, next time buy your own pot and let him buy jewelry!! My dear husband wouldn't even know where the pots huddle before they are brought home, but like yours, he sure does love to eat! !